Client reviews are important to building your law firm’s online reputation and even help improve your Google search engine ranking. But what is the most effective way to go about getting these reviews? The first step is to ASK. It really is that simple. Most clients who had a positive experience with your law firm are happy to do so, but it is important to catch them at the right time and ask politely. Timing is everything. Do not wait. Clients are likely to give you feedback right away. The longer you wait, the likelihood of them taking the time to post a review online about your firm drops dramatically. Emphasize the importance of sharing their experience online as it helps your firm improve its services. Make it easy. Make the online review process easy for your clients. Print out a card with instructions and have it available at your office. Send a follow-up email with links to your firm’s online profile pages. Send reminders. Friendly reminder emails account for a large percentage of client online review conversions. Just keep the amount of times you send a reminder to the client in check. Avoid Yelp. Do not ask clients for Yelp reviews. This almost always backfires. First, if your client is not an “Active Yelper” the review will not stick to your business profile page, it will be filtered. Yelp has specific rules when it comes to customer reviews. They want real reviews from real people, not just one-time site visitors. They go as far as tracking IP addresses, the reviewer’s activity on the Yelp site and other sophisticated tracking methods to confirm the legitimacy of a review. Pristine PR Tip: Want more positive reviews on Yelp? Identify clients who are “Active Yelpers” (i.e. – active contributors on the Yelp site, lots of reviews, lots of friends, followers, pictures, etc.) through your firm’s online surveys. We’ll get to that in the final point. Do not offer incentives. Most of your clients will do this for free. Offering incentives in exchange for online reviews from your clients is a violation of the Florida Bar Advertising Rules. Utilize your website. Put a link directly on your website so clients can leave a review. However, our experience reveals a direct and personal request is often the most effective. Go a step further. Every one of your clients should receive a client satisfaction survey at the completion of their case. At Pristine PR we use online survey software and questionnaire tools. Sites such as Survey Monkey, provide free online questionnaire and web-based survey solutions, allowing you to create and publish online surveys in minutes, collect the responses and view the results graphically in real time. Getting your clients’ feedback is invaluable to your law firm. Positive responses can be added to your firm’s website as client testimonials. These client surveys can also alert you of the negative quickly and give you the ability to mitigate the situation, before a negative review can be written about your firm online. Staying in touch with what your clients’ value allows you to identify new trends and can have a substantial impact on business growth and client satisfaction. Your online reputation is one of your firm’s most valuable assets. Since 2008, we have been helping our clients protect, manage and enhance their reputation online. 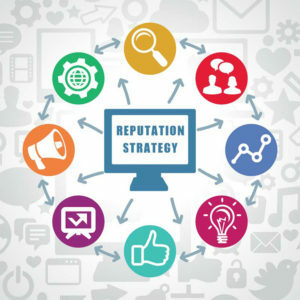 A successful online reputation management strategy will help build trust, bring in new clients and improve your search engine ranking. If you have any questions on this topic or would like to hear how the latest media, marketing and technology strategies can help grow your law firm, contact us TODAY at (407) 982-1707. Also serving South Florida and surrounding areas at (954) 376-3683.